Bright Eyes. High Impact Lips. Glowing Skin. I don't know about you but this is everything I want in the perfect summer look. Basically, I aspire to look like a glowing goddess at all times and I don't think I'm alone in this endeavor...right? I'm always searching for awesome brands to help with my glow efforts and I was more than happy when I found RealHer. Sometimes you find a brand or company whose beliefs truly resonate with you on a personal level and I think I have found mine. Bill Xiang, the founder and CEO of RealHer explains, " I felt like I had this rebirth of myself after my daughter's birth. It was striking to me how complicated it is for a girl to grow into a woman in today's society, and the impact that society has on a woman's life. I want to do whatever I can to make as much of a difference as possible, as quickly as possible, to help more women. RealHer started as a way to create a better social environment for my little girl." It simply doesn't get more precious than that. The products of RealHer are certified cruelty free, vegan, paraben free, sulfate free and are made with natural ingredients. Just when I thought it couldn't get better...it does! 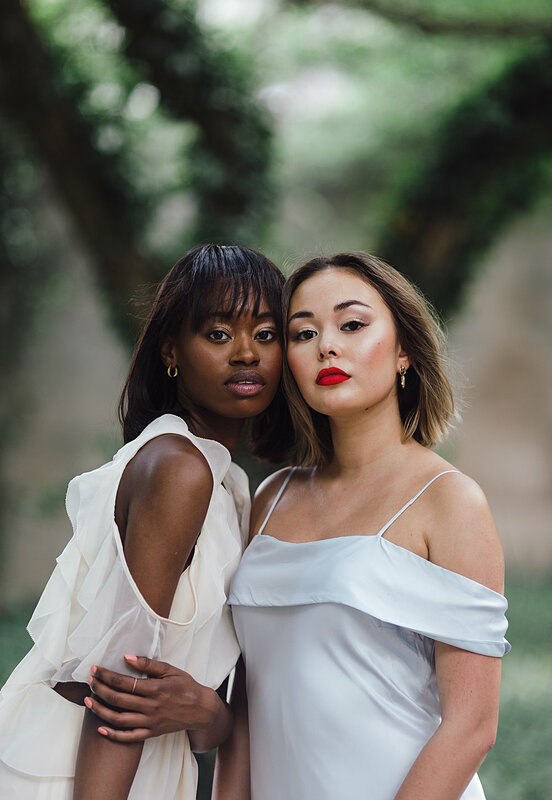 RealHer donates a portion of their profits to non-profit organizations that advance equality for women and girls through scholarship programs, leadership advocacy, and research. After I got my hands on these amazing products, I asked for help from the talented Make-Up Artist Jacob R Strayer to make my models look like glowing goddesses...and he came through! My models, Jordan Phillips and Racheal Gorder, looked angelic in their outfits styled by Amanda Astroth. I felt truly inspired and empowered while working on this photoshoot which is how RealHer wants women to feel all the time. Lastly, the lovely people over at RealHer care so much about us that they're giving us a discount! Use code REALGLOW for 15% off your entire purchase! This code is valid through July 6th so make your purchases asap!